The Pink Panther slot from Playtech is a great slot machine with all the symbols and characters from the Pink Panther cartoon. Playtech delivers a smooth and very interesting slot machine with an excellent feel to it. The Pink Panther slot machine offers 40 lines over 5 reels. There are a number of different bonuses that are triggered randomly when you play. Among the different bonuses you will find are The Color Pink Bonus, Crack the Pink Safe Bonus, Pink Trail Bonus and the Wheel of Pink Bonus. The Pink Panther slot machine gives you a lot of fun and excitement with a fantastic gaming environment and with a wide variety of bonus games and extras. The graphics and sound is all extremely similar to the old cartoon. The music is made up by the very suitable lounge jazz that made the cartoon so popular. Unfortunately, the main theme from the cartoon is not included in this game but the music still deliver the classic pink panther feel and enhance the theme. The wild symbol is a face symbol of the Pink Panther and the wild will substitute for all symbols except the scatter. The scatter does not unlock any free games in this slot. Instead, three or more scatters will give you a bonus which will pay you X5, X25 or X125. You also have character symbols from the old cartoon such as The Inspector and a bean-looking symbol. You also have symbols like a Looking Glass, a Bomb and a Bucket of paint. The lower paying symbols are 10, J, Q, K and A. You may choose to gamble as soon as you hit a win on the reels. You will then have to click on the Gamble button which will take you to a new window where you have to pick which sort of Gamble you wish to do. The options are: Double or Double Half. The gamble is to beat the card revealed – the highest card wins. If you win, you can continue to gamble. If you lose, you’re automatically returned to the reels. The Pink Pow – this is a randomly awarded bonus where 2-6 symbols will “Blow Up” and be turned into Wild symbols. Crack the Pink Code Bonus – this is also a random bonus that might appear on the third reel. You have to pick a safe where inside; you’ll be able to win free games, multipliers and an expanding wild. The Color Pink Bonus – this bonus is random in the main game. The Pink Panther and the Little Man symbol will paint a wall, panther paint pink whereas the little man paint blue. The sum of pink numbers will add up to a multiplier for your current total bet. Wheel of Pink – this random bonus is a wheel of fortune type of thing whereas the wheel actually has two wheels on it. The external wheel will determine your multiplier times the bet you did that triggered the game. The inner wheel will then either give you a “respin” or a back to the main game and “collect” the winnings. Pink Trail Bonus – this bonus is triggered randomly. The bonus features Inspector Clouseau where he is following pink foot prints. Each print is a number that will be added up as a multiplier to the bet that triggered the bonus game. The Jackpot Adventure – this game has two progressive jackpots – the Major Pink and the Minor Pink. Both jackpot games will pay you loads. 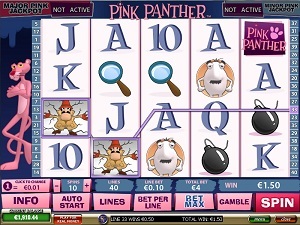 The Pink Panther slot machine will offer you to bet on 40 lines over 5 reels. The lowest bet per line is 0.01 currency credits and the highest bet is 5 currency credits per line. « More slotmachines guides Article last updated: Wednesday, December 13, 2017.